The Tulsi Foundation was founded in the spring of 2015, by Dr. Chet Trivedy. For years he had travelled across India in search of the the elusive big cat, the tiger. During this time he observed that the front line staff had little or no access to medical care or medical equipment. He heard stories of rangers who had to travel 30-40 km often on foot in bad weather to get emergency care. Even on a safari in Kenya the story was the same where front line staff had little access in case of a medical emergency. It appears that access to medical care for frontline staff maybe an Important but overlooked global public health issue. 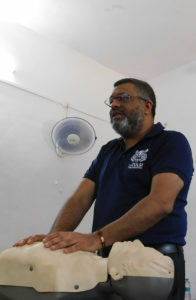 Having worked as a frontline emergency clinician for many years, Dr. Trivedy felt he could use these skills to help support frontline staff working in remote, and often very austere conditions, by providing them with basic trauma training and basic medical equipment such as stretchers, bandages and gauze. Dr. Trivedy, with the support from family and friends, started to look at ways that he could use his medical skills to support the conservation efforts of the frontline forest staff. The idea behind the Tulsi Foundation can be partially credited to his cat, Tulsidas, whose older relatives roam free in the Indian jungles. He would also like to acknowledge support from our co-founder Mandy Hagen, an emergency nurse who pushed him to set up the foundation. Sadly she passed away April 2016 but maintained a keen interest in our activity throughout our foundation period. The Tulsi Foundation is looking to work with a number of experts from a variety of fields such as medicine, veterinary medicine, and zoology to help define and deliver the health needs of front line forest staff. We are very keen to demonstrate that emergency care is a central facet of the ‘one health’ paradigm. Particularly as the health and wellbeing of iconic species is critically dependent on the ability of front line teams to do their job safely. By improving the access to better emergency and acute care, we can mitigate against the mortality and morbidity in our frontline services that do so much to defend the wild. Dr Chet Trivedy is an emergency phys ician based in the UK. He qualified with a degree in clinical dentistry in 1993 and followed to work as an oral maxillofacial surgeon. In 1995 he commenced his PhD in head and neck cancer which first took him to Nagpur, India. Unbeknown to him this was the tiger capital of the world and much of his spare time was taken up by the call of nearby tiger reserves such as Pench and Kanha tiger reserves. His passion for the wild was imbibed into his DNA since his early childhood years growing up in Kenya. After being kidnapped by baboons at age two months and running away from home to look for cheetahs at age four, it was obvious that he would somehow develop a love for wildlife. After completing his PhD his hunger for medicine took him back to medical school where he qualified with an MBBS with distinctions from King’s College London in 2004. He is a fellow of the royal college of emergency medicine (FRCEM) and also the lead crows doctor for the world famous Kia Oval ground in London. He co-authored over 20 peer reviewed publications as well as two popular textbooks on emergency medicine. He is also the chief medical officer of the wildlife conservation trust of India, Honorary Associate Clinical professor at Warwick Medical School and a frontline emergency medicine consultant in London UK. Katey Duffey is a zoologist from the US with a passion for human-wildlife conflicts, specifically with carnivores. She earned a B.A. in Zoo and Wildlife Biology, and a Minor in Psychology at Malone University, and earned a M.A in Zoology from Miami University. Katey spent several years working with a large variety of reptiles, has studied and worked with both captive and wild wolves, and has been studying snow leopards in Mongolia since 2014. One of her research interests is in incorporating the ‘one health’ approach to bring together multidisciplinary knowledge in order to investigate concerns related to an ecosystem’s health as a whole. 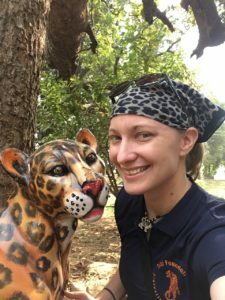 With previous experience as an Army Combat Lifesaver, and training in wilderness medicine, Katey joined The Tulsi Foundation in 2017 to assist in conducting health checks, trauma training, and collecting data on health concerns of field staff in tiger reserves. She was also the recipient of the inaugural Mandy Hagen Award in 2017. Abstract submissions for Tulsicon 2018 are now open ! Welcome to The Tulsi Foundation!